The Donald Sinta Quartet, First Prize Winner of the Concert Artists Guild Competition, has earned praise from audiences and critics alike for its virtuosic performances, compelling recordings and distinctive repertoire. Hailed as “…a tight-knit ensemble exploding with power and virtuosity and an un-concealable ambition to connect with its newly found listeners” (Boston Musical Intelligencer), the DSQ performs entirely from memory, which strengthens an already palpable connection with its audiences. 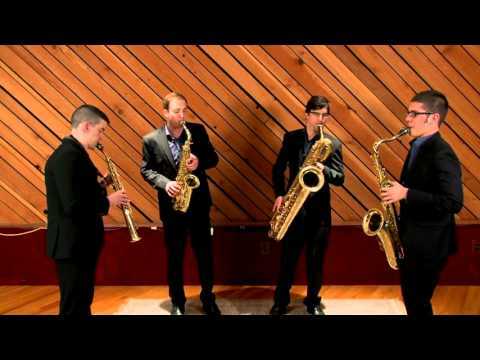 Named for its mentor, legendary University of Michigan Saxophone Professor Donald Sinta, the quartet’s most recent competition success was First Prize in the Winds group at the 2017 M-Prize Chamber Arts Competition in Ann Arbor. The group’s 2018-2019 season began with a bang receiving the Gold Medal in the 2018 Fischoff Competition. Concert engagements this season include appearances at The Trust Performing Arts Center, Grand Valley State University, University of Winnipeg Virtuosi Series, Strings Music Festival, Cecilian Chamber Series, Society of the Four Arts and Allentown Symphony Chamber Music Series. Highlights of their 2017-2018 season included their debut on New York’s Schneider Concerts series at the New School in January 2018, an educational residency at the University of Michigan and a return to New Music Detroit’s annual Strange Beautiful Music marathon of music by living composers. Following their 2016 guest appearance with the Reno Philharmonic performing William Bolcolm’s Concerto Grosso for Saxophone Quartet and Orchestra plus music of Gershwin, the DSQ performed that program in spring 2017 with the DuPage Symphony Orchestra in Illinois. The DSQ gave the World Premiere of Bolcom’s own transcription of his Concerto Grosso with Concert Band, joining the University of Michigan Symphony Band in 2011 for performances at Los Angeles’ Walt Disney Concert Hall, Beijing’s National Center for the Performing Arts and the Shanghai Conservatory. The quartet’s subsequent concerto recording garnered praise: Audiophile Audition declared them “superb musicians” and American Record Guide called it “the highlight of the album.” Featured radio appearances include New York’s WQXR, Interlochen Public Radio, and regular performances on American Public Media’s Performance Today. Recent career highlights include DSQ’s New York recital debut at Weill Recital Hall, Purdue University Convocations, Kravis Center for the Performing Arts, Chautauqua Institution, Bravo! Vail Valley Music Festival, Rockport Chamber Music Festival, Music from Angel Fire and in Michigan at the Great Lakes Music Festival the Detroit Institute of Arts. Among the ensemble’s extensive educational outreach activities, they recently enjoyed extended residencies for Joplin Pro Musica (MO) and Anchorage Concert Association, both culminating with performances as part of their season series. Featured international appearances include recitals in Strasbourg, France (for the 17th World Saxophone Congress), St. Andrews, Scotland (as part of the 16th World Saxophone Congress), Paris, France, Geneva and Montreux, Switzerland, and Thessaloniki, Greece, as well as a trip to Japan as one of a select group of ensembles chosen for the Osaka International Chamber Music Competition. 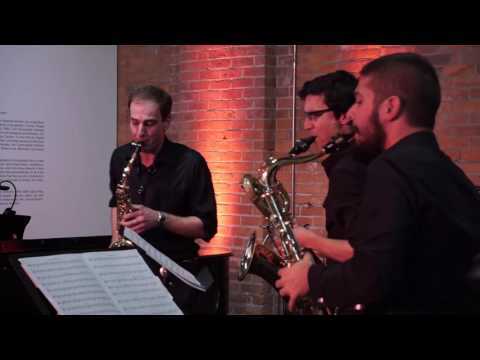 Previous competition victories include the Grand Prize at the 2013 Coleman Chamber Music Competition and First Prize in the 2012 North American Saxophone Alliance Quartet Competition. The Donald Sinta Quartet’s repertoire is diverse, ranging from commissions by today’s emerging composers to standards from the saxophone quartet literature to transcriptions by master composers such as Dvorak, Schubert and Shostakovich. 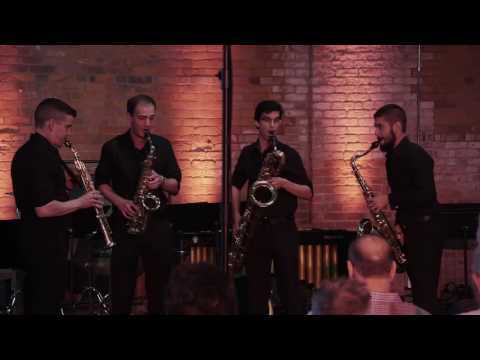 As advocates of new music, the quartet runs the National Saxophone Quartet Composition Competition, which selects two new quartet works from up-and-coming composers. The group has just recorded its debut CD, to be released during 2017-18 on CAG Records. Founded and still based in Michigan, DSQ’s members are all Selmer-Paris Artists. “The Sinta plays with astonishing virtuosity, subtly beautiful phrasing and exquisite ensemble no matter how rhythmically complex the music is. "